Thank you for your interest in our school. 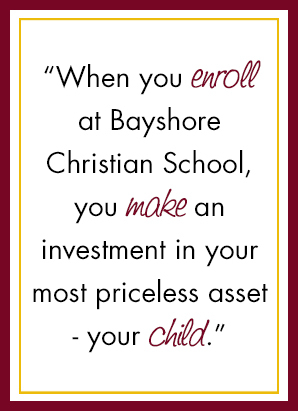 When you enroll at Bayshore Christian School, you make an investment in your most priceless asset—your child’s future. Now that you know what we’re all about, we invite you to apply. Apply today, and show your child how much you care about his/her academic and spiritual well-being. The Most Opportunities…Your child will receive the most opportunities to develop the character, intelligence, and skills needed to be successful in life. Christ Centered…We provide a Christ-centered education based upon God’s Word. Motivating Teachers…Our highly qualified faculty and staff are deeply dedicated to our diverse student body. Holistic Approach to Academics…Our rigorous college preparatory focus is centered on creating a well-rounded student prepared for university and beyond. Fine Arts…We remain committed to excellence through our performing and visual arts programs that challenge the creativity of our budding artists. Athletics…Our dedication and commitment to our student athletes and their training goes beyond the game. Accredited…We are fully accredited by the Association of Christian Schools International (ACSI); Southern Association of Colleges and Schools (SACS and Advanced Ed); Florida Council of Independent Schools (FCIS); and Florida Kindergarten Council (FKC). 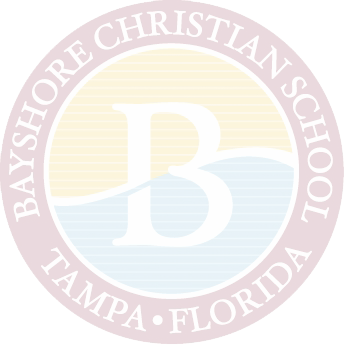 We are a co-educational, college-preparatory school founded in 1971 as a ministry of Bayshore United Methodist Church. Our beautiful campus sits on approximately 10 acres in residential south Tampa. We offer a quality education in a traditional academic setting for students as young as two years old up through the 12th grade. Our faculty members each hold a B.A. degree and many hold a master's degree or higher. Each teacher professes a salvation experience and is active in a local evangelical church. We are an interdenominational school. We require our students to attend Bible classes and weekly chapel services. We are an evangelical Christian school that teaches and models Biblical standards of behavior. We establish rules and regulations as guides for student behavior. Students in K5 through 8th grade take the Terra Nova 3 National Achievement Test each spring. Students in 8th grade take the PSAT 8. Freshmen, sophomores, and juniors take the PSAT/NMSQT, and seniors take the SAT and/or ACT, plus the ASVAB. We also administer other aptitude tests and interest inventories upon request. We invite you to give us a call to schedule a campus tour or to discuss any questions regarding our application process.